It’s taken some time to get off the ground, but I’m happy to announce the All Weather Solar-Powered Field Station project. The All Weather Solar-Powered Field Station is my attempt to put together a man portable, rapidly deployable, 2 operator, solar-powered field station other operators, clubs or organisations in the emcomm or survival communities can replicate. That said it’s also important to remember that this is just the template or kind of a guide. I’m just showing you how I’ve been able to implement my field station. How you implement yours will depend on your requirements, budget, and of course your individual goals. Remember there’s no right or wrong way here. There’s only the way we achieve our goals! This is a living article. It will grow and change as the project progresses. The station is field deployable in all weather conditions. Can operate voice or digital modes (ALE, FSQ, PSKMail, WinLink, …) @ QRP-QRO levels for 24 hours under its own power, or up to 5 days with a solar generator. Will provide the minimal comforts needed, eg sleep, food prep, heat, … for the 2 operators in the field. In September 2017, we saw hurricane after Hurricane ravaging the West Indies, Virgin Islands, and Caribbean in its entirety. This isn’t the first time it’s happened to the region, and definitely not the last. If ever there was reason for ham radio operators to get onboard with the importance of off-grid power and communications for disasters, September 2017 would be it. Still there is more! Hurricane Maria hit Puerto Rico knocking out grid power and devastating local infrastructure. This also meant grid-Communications on the island were knocked out, along with local cellular networks. Emergency services took nearly a week after the disaster to get on site (not a criticism), so information into or out of the region (for normal prople) was effectively blocked. The Red Cross did deploy comms resources in cooperation with the ARRL, but that is an entirely different story. The only thing we know for certain is most governments will throw lots of money and resources at disaster recovery, without necessarily achieving a beneficial result for the people in the disaster zone. What is important to understand from the disaster in Puerto Rico, is the importance of getting individual ham radio operators, clubs, and/or local organisations to take responsibility for themselves! Puerto Rico is the example, but this can happen anywhere. So we need to invest time, money and training resources required to put together a similarly equipped, all weather, man portable, off grid field station. A field station which can fill in the gaps immediately following a disaster, up to the time Emergency Services get boots on the ground. Hams in the disaster zone, creating a flexible network, in the disaster zone. This is all about self-reliance, and sharing the load. Deploy a real-time HF data net around the affected area using ALE or FSQ. This will allow the deployed stations to communicate “in real-time” with one another. It also allows all stations to get a near real-time heartbeat from stations in the field (sounding ALE, FSQ). Morover, with the data net up, stations can text, send/receive files, request voice call, communicate with stations they can’t hear, by bouncing off stations they can hear (FSQ), or get status & locations of other field stations. Use WinLink to pass logistics, well & safe or other critical information where no real-time capabilities exist. This is especially useful to get messages into and out of an affected area. It also allows messages to be collected, although the station may not be online at the moment. One exampke is a station managing its battery capacity by operating at partial capacity conserving battery power. WinLink email can be collected at set intervals to conserve station power. Get operators and organisations to improve skills, adopt standard tools for EMCOMM, and becoming more able to adapt to a guerrilla style deployment, where no logistical machine exists to support you. I’m excited to say the first field test went off without a hitch on November 11th 2017. Of course I didn’t have all the equipment I wanted to have. So what I didn’t have, was substituted with gear I already had. For this first test I used the Nortent Tipi 6, the Yaesu FT-817ND, Chameleon MPAS, LDG Z817 tuner, PowerFilm FM16-7200, my bespoke 5Ah A123 4S2P pack, and Genasun GV-5 charge controller. All gear was packed and hiked in using a Halti Bsse 80 pack by a single unsupported operator. Testing solar-charging in low-light condx. It was important to get a running start with the station during this few days of reverse-winter, before the snow and extreme cold arrived (again). Like everything else on the blog and channel, it’s usually trial by fire. Still it’s important to take baby steps proving each part of the station before a real deployment. I’ll continue with these baby steps near home, increasing deployment complexity and distance from home as I become more comfortable with the station. Once the entire station is assembled and all the components are here, I’m planning on a test IOTA deployment, not too far from home. That’s on the Island of Hailuoto. Then perhaps a second test deployment in Lapland in spring 2018. Finally a full-blown deployment with Travel, Hike, Camp, on an IOTA somewhere in the Baltic between Sweden and Finland. The goal will be to stay off grid and in the field, operational, for a minimum of 5 days. That will include the station being operational 24 hours a day, accessible through ALE, WinLink, and PSKMail. So often I hear the arguments between ham proclaiming one system better than another. ALE versus WinLink, WinLink versus PSKMail, ARDOP this WINMOR that, bla bla nla. I would like to propose a change of thinking. Let’s stop thinking of these things in terms of politics and fanboys, and start looking at them in terms of tools that are a part of a tool set. The concept of ringing or calling up either a single station or group of stations is usually not something a ham is familiar with on HF… Often our only experience with selective calling is on a networked VHF/UHF digi voice system. The “alerting” aspect of ALE and FSQ is also foreign to operations on HF. Yet the “selective calling” aspect of ALE and FSQ, is probably their main strength. The flip side of selective calling is the “alerting” aspect, informing the operstor of incoming calls or messages. ALE and FSQ allow stations to build or become part of a makeshift “network” of stations. This is done without the grid, without prior schedule and without coordination. ALE – ALE uses a standard set of frequencies on HF 80-10. As long as you have the standard frequencies programmed in for your region, you don’t need to know if an operator is there or not because all stations are sounding, and all stations will be displayed in the station list. No prior planning or frequency coordination is necessary. Stations can selectively call individual stations, a group of stations, or all stations, who will who will in turn receive an alert of the incoming call or message. While scanning, ALE will automatically create the log of the stations heard, the bands it heard them on, and best band to initiate voice or messaging between stations. If there are Pilot stations deployed, normal ALE stations can bounce over to stations they can’t hear, through stations they can. There’s also a couple ALE specific techniques to ‘force’ stations to respond to your emergency calls. Global Anycall, netcall on the data net HFN netcall, on the voice net, HFL netcall. Global ALLCALL. Global allcall locks everyone’s scan on your freq and opens their squelch, allowing you to make a voice broadcast to everyone on the net. You can send a global allcall with an AMD, like a broadcast text. a lot of the professional and gov nets use ANYCALL and ALLCALL for emergency alarms. ALE runs embedded on many HF radios, and also on Windows using PCALE or MARSALE. FSQ – The fact that FSQ is usually overlooked for emergency communications is blasphemy at best. FSQ is very much like a single-channel ALE. The only thing an operator needs to know, is what band to operate on during the grid down scenario. No other prior planning or coordination is required! Like ALE, stations are sounding at set intervals. Stations you hear are displayed in a station heard list, but like ALE, you can selectively call any station, by entering its callsign. Any station appearing in your heard list, can be asked for the stations own heard list, you can use that station to route through to the stations it can hear. Stations can selectively call other stations, a group of stations, or all stations. FSQ allows messaging, file and image transfer, and telemetry, all without grid comms. FSQ is already built into FLDigi, and has its own Windows client. Getting messages in or out of the disaster zone. In my opinion, the best tools for getting messages out of a disaster Zone where grid Communications have completely failed, is radio email using WinLink or PSKMail. Both of these tools allow ham radio operators to send messages outside of the disaster Zone to anyone with an email address, provided they can find and communicate with a gateway, outside the disaster zone. At that point, the operator can send radio email without grid comms locally. Moreover, anyone can send that ham radio operator and email without being a licensed ham. In regards to HF communications I’m not tied to any one manufacturer for gear. This is an expensive undertaking so a company supplying gear supporting the project goals will most certainly be welcomed. HF Radio – 20w radio running ALE, WinLink, FSQ for HF. Size and weight are critical here, as is battery efficiency. Something like the Elecraft KX2 or mcHF would offer deployment flexibility needed for a man-portable station in the field. Remember a high-power radio is almost useless if it can only stay operational for a few hours because of its current draw appetite. VHF/UHF Radio – I have an unused Kenwood TM-D700 just doing almost nothing. It’s an extremely capable radio with excellent receivers. It’s capable of monitoring VHF and UHF up to 23cm. It also has two completely independent receivers for full duplex operation on two bands. One of the projects I’ve considered for the channel is making this radio into something that’s more easily field deployable. The radio could offer VHF UHF voice comms, aprs, and of course integrating it with some type of portable computer to allow it to run digital modes eg WinLink, FSQ, … Natualy I would integrate a LiFePO4 battery into the radio, then mount the entire kit into a lightweight case/pouch, leaving the head unit accessible for table top deployment, and a breakout box to access antenna and ports outside the pack. It’s Important to remember this is a tool box. there are too many operators who could carry everything all the time. instead we deploy what we think we need to achieve the goals. In regards to emergency communications, I’m primarily and HF operator. Broadband dipole -firstly there’s the Broadband dipole. The Broadband dipole is used when there is a need to deploy an ALE, MARSALE, or fill-in WinLink gateway in the field. Stations are constantly scanning multiple HF bands. To reduce station complexity, an antenna which requires no tuning, is preferred over complex tuner, (imho) provided the antenna is as efficient as possible. I’m told there’s a new lightweight version on the way to me. We’ll feature that on the channel when it arrives. Antenna supports Supporting the wire antennas for ALE, or any mode requiring rapid band scanning, I’ll be using fiberglass telescopic masts. The shelter comes from a company called NorTent in Norway. They have been incredibly helpful and making sure their shelter system fits the needs of extended field communications operators in the backcountry. They know winter and rough weather camping! At the moment I’m testing a near final version of their Tipi 6 system. The Tipi 6 has flysheet, inner-tent, , floor, mesh inner doors, … it’s made of silnylon and weighs nothing. Seriously, nothing! For those of you considering the Seek Outside tipi tent, the Nortent Tipi 6 is so much over the top, it’ll redefine customer expectations in the hot tipi tent genre. Something that may not be completely apparent about the tipi is it’s modularity. What you saw in my first test outing was just the fly sheet. It wasn’t raining or snowing so I saw no need to deploy the ground sheet or the inner tent. In this configuration the Nortent Tipi 6 is just a shelter. Since it’s a modular design, it’s possible to deploy just the fly sheet, or the fly sheet and the ground sheet, or the fly sheet and inner tent, or any combination of those. When the wood stove is in use, the ground sheet splits to expose the ground to avoid damaging the silnylon. Someone asked why I won’t use one of the traditional Expedition style tents . The simple answer is i’ve had Expedition tents in the past. Since it’s more difficult to integrate a wood stove inside, I thought a traditional Nordic tipi would be right tor my region. Building an efficient station in the first place. Increasing storage capacity the understanding that it will also increase weight. Rationing the available power we have based on conditions. With that said, I’ve finally decided on the power for the field station. The station will be powered by a 40Ah 4S4P LiFePO4 battery pack with 50A draw capability (which the station should never need) to power the radios, laptops, & lighting for the station. Solar Panels – This part of the project is already moving forward. Solar power for this field station is provided by a PowerFilm FM16-7200. This 120w panel provides up to 7.2A of current to keep our storage batteries charged. In the event that the 120 watts at 7.2 amps isn’t adequate, or the sun isn’t cooperating, I also have the daisy chain cable allowing parallel connection of other PowerFilm solar panels for added solar generation. This is important for extremely grey days, or darker times of year at high latitudes. Battery storage – The proof-of-concept for the battery storage was the 10 amp hour lithium iron phosphate battery pack for ham radio. The second step in that journey was the 4S2P LiFe04 based on A123 cells, which should be published shortly after this article. For the field station, I unwittingly considered ~96Ah or 1228Wh of battery storage. What I didn’t consider was how to carry that. I need to rethink this! In Scandinavia I can get away with 20Ah storage battery during spring, summer, and early autumn. November through February offers unique challenges for solar powered field stations. Storage capacity needs to be increased as much as possible, and some sort of rationing needs to be considered as well. This is also another reason for the Dual operators. A single operator could carry the station, food and supplies for up to 5 days in the field. A second operator could be employed to carry the battery storage. My goal is to use a ski pulk sled during winter months to carry the additional weight. The second operator would definitely be a blessing though. Going back to the battery capacity, 20Ah would be enough if all the stars are aligned in the planets are in the right order. Introduce more than a couple of days of Grey days or rain and the plan fails. since that 20 amp hours doesn’t leave any margin of error, I’ve settled on a 4S4P 40-48Ah battery pack based on Headwsy 38120 or 40120 cells.. The pack will power a 20w field station, 2x Rigs, LED Lighting, 2x Laptops in worst case scenario. – Some airlines don’t allow more than 100Wh “per battery” onboard aircraft. 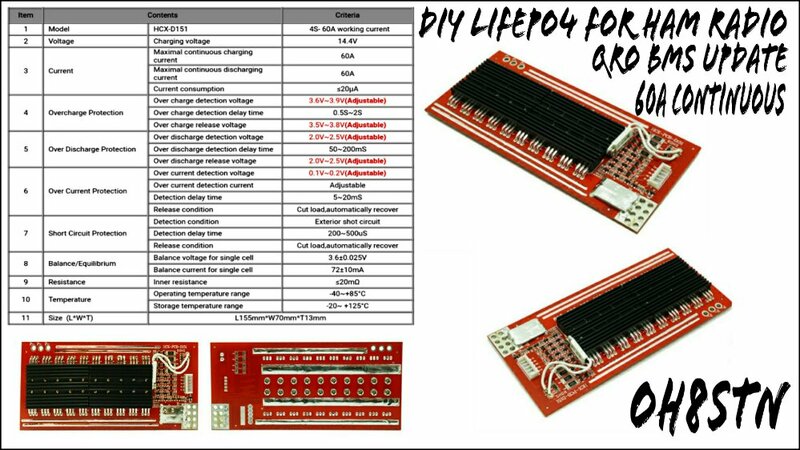 Battery management – As we’ve already learned with the 10 amp hour lithium iron phosphate pack, the qrp battery pack project, and the 5 amp hour lithium iron phosphate based on A123 cells, the BMS is an important aspect of battery health. I did find a BMS capable of handling the high currents associated with emergency communications at QRO levels (20w is QRO for a QRP Operator). That BMS arrived today. I’ll retrofit this BMS into the 10 amp hour lithium iron phosphate pack, when it arrives. Perhaps I’ll make a video from it. A good friend of mine Paul Sweeney asked about weight and if I can carry everything by myself. Actually during the non winter months I plan on using a hiking trailer. it’s a new trailer about to hit kickstarter called the HipStar. This Hiking trailer is designed to help me to carry much more weight than I normally would, placing that weight over a set of wheels, rather than on my hips and shoulders. I will look at the testimonial video I created for the kickstarter campaign. A couple of years ago I did a hike above the Arctic Circle using a DIY version of a trailer like this . My design was a fail, but the concept was definitely positive. I’ve seen other hiking trailers like the monoWalker, but I feel the single wheel design puts too much lateral stress on the body, when off balance. So I was definitely looking for a two wheeled design. During the winter months of I’ll use a Pulk sled to carry my gear. Pulk sleds have been a trusted method of moving large payloads over ice, snow and frozen sea since human beings have lived in the Arctic. I don’t think very much more explanation is needed for the pulk. This is a playlist of ideas at the moment. The playlist itself is private, it can only be viewed through this website. It’ll give us the proof-of-concept and sneak peeks at all the components coming together to build this man portable Field Station. As always, support for these big projects is always appreciated. This project is especially important, as we’ll start with planning the field station, documenting the desired functionality, collecting all of the individual components, and building or reviewing each component on the channel. Finally, this project will end with the field deployment “5 days off-grid”. We’ll take the entire station out into the field, set up camp, and activate a remote location off-grid for 5 days. In that time, stations from all over the world will be able to interact with me through various data modes and phone, which will all be shown on YouTube. If you’d like to help support this project, individuals can contribute through PayPal or Patreon (please message me so I know), or using my Amazon link (TBD) to make your purchases. Companies or organizations wishing to support or contribute gear for the project, can contact me through email using my first name at my callsign dot org. 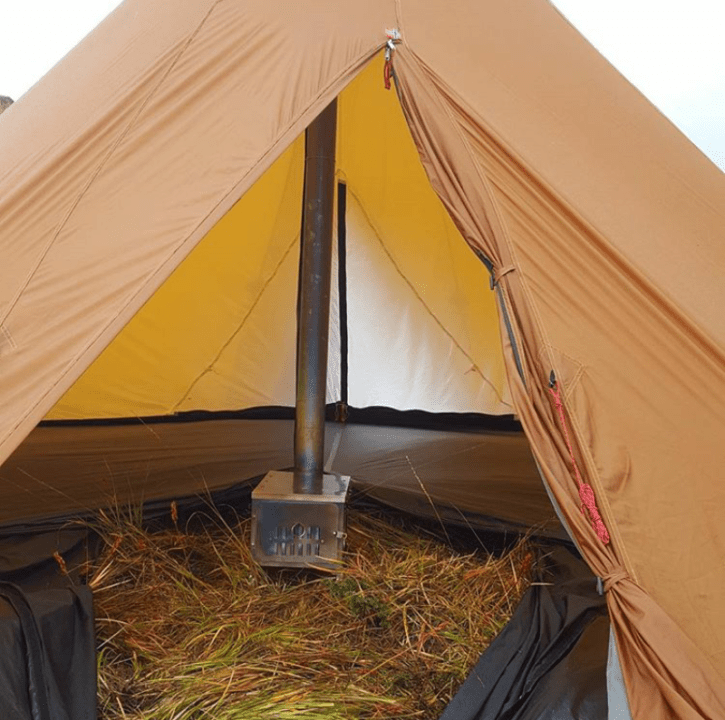 Nortent made it possible to aquire the Tipi 6 and wood stove for the project. Chameleon Antenna supplied several antennas for the project. Super Antenna has supplied the project with several antennas. Spiderbeam has supplied a 12m telescopic mast for the BBTDs. An Anonymous Operator from Germany donated 50€ to be used towards LiFePO4 cells.